TCS has come out with their yearly Gen-Y survey, that reflects the digital habits of school students in India. The survey conducted over 14 Indian cities and 17478 students aged between 12-18 years shows that Smartphones are now becoming the principal and the most popular device for Indian Teenagers. Mobile Phones have become so popular among Indian school students now that they have overtaken Home PC ownership across India. 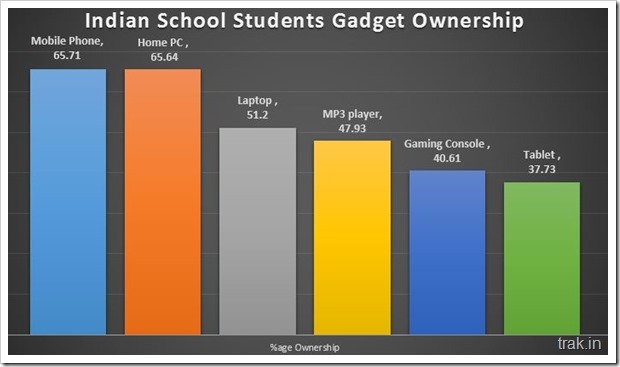 At an average 65.71 percent students owned Mobile Phones as compared to 65.64 percent home PC. Mobile phones not only have highest ownership, but their usage is also much more than any other gadgets owned by Indian school students. At all Indian level over 33.65 percent of the respondents said that they use Mobile phones most as compared to computer (21.27 percent) and Laptop (18.03 percent). Interestingly, mp3 players that used to be quite popular seem to have gone out of favour with only 12.57 percent saying they use it the most. Incase of tablets as well, only 13.38 percent use it most often! 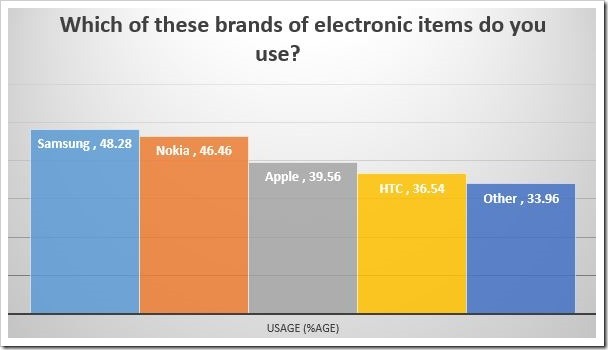 While Samsung is clearly the brand that is used most by Indian Gen-Y, Nokia remains to be be quite popular. I am also quite surprised that Apple has significant usage among Indian school students with nearly 40 percent using some Apple product. According to the TCS report, one of the reasons why “other” percentage is so high because Indian brands like Micromax, Lava , Xolo are quite popular among Indian students as well! Even in Mobile phones, Smartphones are getting very popular with nearly 60 percent now having it as compared to feature phones and other devices. And when it comes to the Operating system on their devices, Android is definitely the leader with nearly 53.7 percent owning an Android based Smart Device. Windows is picking up pace with 33.69 percent while iOS comes in at 3rd with 22.91 percent usage across India. While Facebook remains uber-popular with staggering 91.54% national average, sites like Pinterest and Linkedin are now gaining popularity as well, especially in Metro. Interestingly, Seventy Two percent school students in India access internet from their home, while only 18 percent access from their mobile phones! 1 out of every 4 children spends more than an Hour on the Internet while 50% of the respondents spend more than 30 minutes. 4 out of every 10 children prefer shopping online and its popularity is on the rise. From career perspective, IT and engineering still remain the most popular career streams among Indian students. However, new careers like Retail, Tourism, Media are starting to get popularity as well. I was expecting this kinda results as nowadays students love to use Mobile Phones…In fact the recent trend is students are even using it from lower schools…Mobile phones are easy to use and after all it is mobile too….It’s good to see that Nokia is doing good businesses along with Samsung in this survey…Sometimes I feel pity on the current condition of Nokia which was once undisputed king of mobile world….